The title of this post was taken from the song Iridescent by Linkin Park. Locks, they serve a lot of different purposes. They are meant to keep things out, or to keep something in. They can make you feel safe from the outside world, or they can keep you locked inside your own personal hell. Locking my door as I walk out in the morning is an automatic response. A flick of the wrist and the lock is set. I shut the door and without a key, getting back in is difficult. Last week I came home from work to realize that something wasn't quite right. The key didn't slide smoothly into the lock. I twisted, turned, pushed, pulled, and yelled at the key, but it was jammed. Panic set in. I mean my life is busy, I didn't have time for this. One last try and all of the sudden the key went in and I was able to get in the house. I don't know what happened to the lock, but it continued to be stubborn. I once again called my dad for help. I need my locks replaced, and while we were at it I asked if we could change the one on the front door. Mike and I never had a key for that one. Twelve years we've lived in this house, and we never had a key to the front door. My dad went to Lowe's that night and picked up what I needed. Today he came over and changed the locks on the back door. After he left I found myself standing in front of the door just staring at the locks, tears rolling down my cheeks. I looked over at Mike's keys still hanging on the hook where he left them. His key would no longer fit the back door. He wouldn't have the right key on his ring. I know he's not coming back. I know he doesn't need his keys. I know that it shouldn't matter, but it does. It's just one more thing that has changed in my life, one more thing that he won't be apart of. It's one more decision I've had to make without him. It's one more small change that makes the house just a little more different than it was before. Him being gone is a big enough change. On the flip side of this depressing post, there have been some changes that make me smile and keep his memory alive, like our new trashcan. You might be wondering why my new trashcan reminds me of him, let me explain. See I bought one of those trashcans with a sensor in it, so you just move your hand in front of it and it opens. 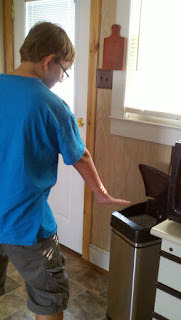 The kids love running into the kitchen, throwing their hands out in front of them, and pretending they are Jedi Masters using The Force to make the trashcan open. They crack up every single time, and it always leads to a discussion about how much their father loved Star Wars. Mike would have loved this trashcan, and he would have pretended to use The Force on it as well.